In recent years, the neighbourhood has gained increasing attention as a venue and vehicle for social change. Interest in neighbourhood, or place-based, development has escalated in concert with the body of research identifying the ways in which neighbourhoods can influence both individual well-being across the lifespan and the social and economic conditions of cities, for better or for worse. Research on neighbourhood effects has grown exponentially in the past few years, with more than 25,000 new research studies and other academic articles published since 2009. These and previous studies show that individuals and families are affected by the neighbourhoods in which they live. Some people are affected more than others, depending on a broad range of factors. Neighbourhood “effects,” defined as the “net change in life chances associated with living in one neighbourhood rather than another,” can be either positive or negative, although much more is known about negative than positive neighbourhood effects. There is considerable evidence that living in a neighbourhood with a high concentration of poverty can diminish the life chances of both children and adults. 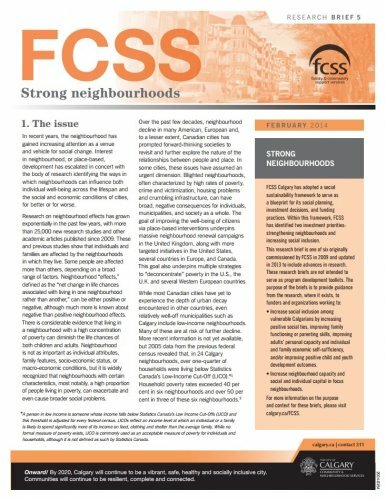 Neighbourhood is not as important as individual attributes, family features, socio-economic status, or macro-economic conditions, but it is widely recognized that neighbourhoods with certain characteristics, most notably, a high proportion of people living in poverty, can exacerbate and even cause broader social problems. 2. Neighbourhood effects: What are they and how do they work?